What goes together better than coffee, donuts, and running shoes? A lot. But Saucony is banking on people thinking otherwise. Available for pre-order, the Saucony x Dunkin’ Kinvara 9 running shoe was created to celebrate the 2018 Boston Marathon. Obviously, most of New England is in on the joke of just how much Dunkin’ Donuts the region consumes, so Saucony chose to cash in on their slightly egregious obsession with mediocre coffee and breakfast pastries. 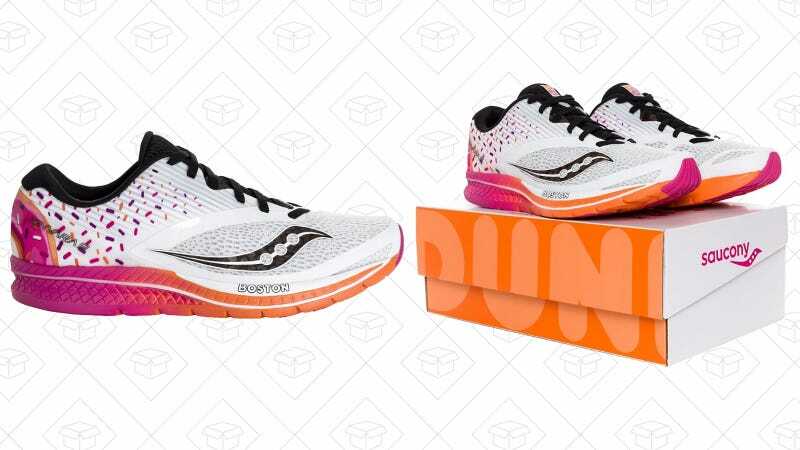 While the outside of the shoe seems off-brand, featuring Dunkin’ orange and pink with sprinkles splashed across the heel with the classic/annoying/inaccurate “America Runs on Dunkin’” catchphrase, the insides are Saucony through-and-through. The sneaker, which is Saucony’s staple Kinvara 9 style, features a full EVERUN topsole (which is Saucony’s proprietary cushioning) which helps keep the shoe neutral and balanced for your run. If you’re in the market for a new running shoe that feels a little more playful than your typical sneaker, this collab may be for you. Maybe they’ll create a Starbucks version for everyone with at least slightly better taste in chain coffee shops than all of the northeastern United States.